The cyber attackers declared war on the jihadis, also known as ISIL and Daesh, in the wake of the Paris attacks last week. And now the group has released a statement claming the terrorists are planning up to EIGHT attacks on the same day – November 22. Alongside the hashtags #22Daesh #OpParis, they published a list of events in France, the United States, Indonesia, Italy and Lebanon which are reportedly being targeted. They include the WWE wrestling event at the Philips Arena in Atlanta, Georgia and a performance by an American heavy metal band in Milan. The women’s rights demonstration has already been cancelled after French president François Hollande declared a state of emergency in the wake of the killings.The French parliament voted to extend this to three months, and includes beefed up security measures such as banning demonstrations. The hacking group, identified by a trademark mask, added some events are not ‘100% confirmed’ as at-risk. Anonymous claims to have passed on all intelligence to security services around the world, adding: “They have it and it is their responsibility to do something with it.“But because they have not done anything with it yet and it’s almost the 22nd, we have matters into our hands. The online crusaders are thought to be behind thousands of twitter accounts supposedly linked to ISIS removed in recent days. Terrorists slaughtered 130 people on the streets of Paris last Friday. 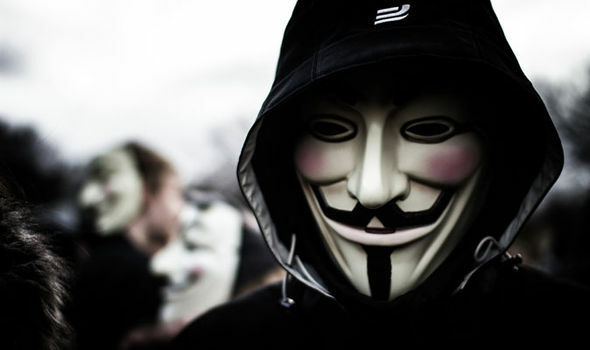 Anonymous, also referred to as ‘hacktivists’, declared their opposition to the terror regime following the Charlie Hebdo attack in January, which left 12 dead. But they launched an all-out offensive following the latest French massacre.